When Nancy became a vegetarian as a teenager, she found it easy to balance her diet with an active lifestyle. After she was diagnosed with celiac disease in her 40s, however, suddenly she couldn’t eat the variety of foods she once enjoyed. Whole wheat bread, granola, and many of her beloved high-protein meals and snacks, including seitan, veggie burgers, falafel, and barley-based miso, now were off limits. The different types of vegetarians, from people who avoid all meat, fish, and poultry to vegans who avoid all foods of animal origin, including eggs and dairy products, especially find it difficult to eat healthfully and obtain the nutrients they need while following a gluten-free diet. 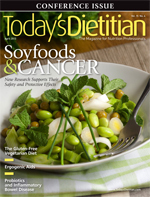 This article will discuss the types of vegetarian foods containing hidden gluten and the nutrient deficiencies common in vegetarian clients with celiac disease and provide meal and snack options RDs can share with clients. It’s no secret that gluten is ubiquitous in the typical American diet, yet vegetarian dishes tend to rely more heavily on wheat, barley, rye, and oats, either as a source of protein or as a binder or filler. Many commercially available veggie burgers, veggie sausage links, or textured vegetable protein crumbles contain gluten. Seitan, also known as “wheat meat,” often is used in vegetarian Asian fare. Tempeh may be made with wheat or barley, and tofu may be breaded or flavored with wheat-derived soy sauce. In addition, gluten frequently appears in processed foods, including sauces, candy, beer, soups, and supplements. Cross-contamination also is a concern, both at home and restaurants. Even though foods such as French fries are made from only potatoes, restaurants often fry them in the same oil used for other breaded products, making them unsafe for anyone with celiac disease. The first step RDs should take when counseling vegetarian clients with celiac disease or gluten sensitivity is to teach them basic label-reading skills to identify hidden sources of gluten, ways to avoid cross-contamination when preparing foods at home, and strategies for dining out. They also should provide support to balance nutritional needs, which is critical. Research indicates that fewer than one-third of women with celiac disease consume the recommended amount of calcium daily, and this is presumably lower among people who avoid dairy.3 The intestinal damage resulting from celiac disease temporarily can hinder the digestion of lactose in some individuals shortly after diagnosis. This lactose intolerance causes GI symptoms, such as bloating, gas, and diarrhea, after eating dairy foods. Subsequently, clients may avoid all dairy products, not realizing they can choose foods low in lactose, such as hard cheeses, or lactose-free milk and yogurts to obtain the calcium they need without experiencing GI symptoms. Moreover, many gluten-free diets are low in B vitamins, and B12 is of particular concern for vegans. “Many fortified foods may not be gluten free, and many gluten-free foods are not fortified,” Thompson says. Fortunately, whole grains contain a range of B vitamins (except B12) and some protein. While quinoa has long enjoyed elite status in the vegetarian world as a complete protein, other options include buckwheat, millet, amaranth, sorghum, and teff in addition to the more familiar whole grains, such as gluten-free oats, wild rice, brown rice, and corn. Vegetarian clients with celiac disease or gluten sensitivity may miss their favorite foods initially, but once RDs identify all the gluten-free vegetarian options available, clients can enjoy a wide variety of nutritious foods once again. There are many gluten-free recipes that include protein sources, such as beans, lentils, soy, whole grains, seeds, nuts, dairy, and eggs. Begun also recommends bean dishes, such as bean chili, lentil soup, black bean soup, or split pea soup. Beans are nutrient-dense sources of protein, iron, and calcium, and a great source of fiber. Gluten-free whole grains lend themselves well to quick and easy meals. Clients can microwave quinoa in minutes to make a pilaf; they can pair 100% buckwheat soba noodles, which cook in fewer than 10 minutes, with veggies and peanut sauce; and they can top whole grain gluten-free pasta with sauce and serve with steamed veggies. Precooked wild rice tossed with feta, cucumbers, tomatoes, and olive oil is another simple but tasty meal. For customer convenience, precooked brown rice, wild rice, and quinoa are sold frozen or in pouches, but urge clients to read labels, as these ready-to-heat processed foods may contain gluten. Naturally gluten-free snack options include fruits and vegetables that clients can serve with hummus, salsa, guacamole, or another type of dip. Clients can eat a variety of nuts, seeds, popcorn, yogurt, cheese, hard-boiled eggs, edamame, roasted garbanzo beans, or soynuts, or they can make their own trail mix. Fruit or vegetable smoothies with yogurt or tofu for protein are a quick and easy snack or light meal. For many vegetarians with celiac disease, following a gluten-free diet can be a challenging transition. But with careful planning and by focusing on the available nutritious food options they can eat, RDs can help make their journey a smooth one. — Cheryl Harris, MPH, RD, is a dietitian in private practice in Alexandria and Fairfax, Virginia, specializing in helping people follow a gluten-free diet. She’s also a nutrition advisor for the DC Metro Area Celiac Support Group and speaks locally and nationally on celiac disease. • Pulses and the Gluten-Free Diet: Cooking With Beans, Peas, Lentil, and Chickpeas by Pulse Canada in collaboration with Shelley Case, BSc, RD, and Carol Fenster, PhD. A free, downloadable PDF is available at www.pulsecanada.com/food-industry/pulses-and-gluten-free-foods. According to RDs interviewed by Today’s Dietitian, you can recommend the following tasty vegetarian, gluten-free meals and snacks to clients. They’re available in supermarkets, specialty health food stores, and online. Amy Jones, MS, RD, LD, highly recommends Garden Lites Vegetable Souffles, particularly the zucchini and roasted vegetable varieties. Glutenfreeda Vegetarian Bean/Cheese Burritos are ”great for lunch boxes and easy to heat,” she adds. And her all-time favorite is Ancient Harvest Quinoa Pasta. Shelly Asplin, MA, RD, LMNT, likes GoPicnic Ready-to-Eat Meals Hummus + Crackers because they’re convenient and portable. Sandwich Petals, which are allergen-friendly whole grain wraps, are perfect for lunches. Alysa Bajenaru, RD, is a big fan of the exotic flavors of Bhuja snacks and buys Mary’s Gone Crackers in bulk, which are organic and high in fiber and protein. Love Grown Foods granola also tops her must-have list. 2. Add broth to the skillet, bring to a boil, and simmer 12 to 15 minutes or until the broth is absorbed and the quinoa is soft and fluffy. 3. Add in one-half of the mint leaves and stir. Squeeze in lemon juice, and season with salt and pepper to taste. Add in tomatoes and the rest of the mint leaves when cooled. *This step can be done in advance or skipped altogether, but it does enhance the flavor. 1. Sapone A, Bai JC, Ciacci C, et al. Spectrum of gluten-related disorders: consensus on new nomenclature and classification. BMC Med. 2012;10:13. 2. Lee AR. Anemia and celiac disease. In: Dennis M, Leffler D. Real Life With Celiac Disease. Bethesda, MD: AGA Press; 2010:331-335. 3. Thompson T, Dennis M, Higgins LA, Lee AR, Sharrett MK. Gluten-free diet survey: are Americans with coeliac disease consuming recommended amounts of fibre, iron, calcium, and grain foods? J Hum Nutr Diet. 2005;18(3):163-169. 4. Pagano AE. The gluten-free vegetarian. Practical Gastroenterol. 2007;9:94-106.